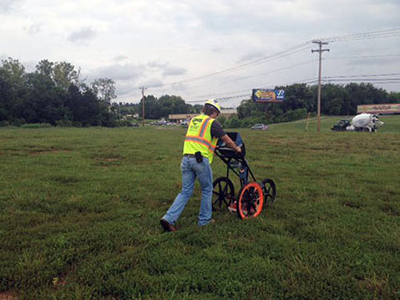 A local environmental consulting contractor working on a future Speedway gas station site in Lebanon, Tennessee recently contacted GPRS to help locate private utilities prior to drilling multiple soil boring locations. Grid scans with ground penetrating radar were performed around each soil boring location to ensure no utilities were hit during the drilling process. GPRS also utilizes a radio detection device which helps in locating live electrical power and communication lines. Ground penetrating radar is an accurate and effective way to help locate underground utility lines or any other material that may be underground. Matt Johnson is the regional manager for GPRS operations throughout the state of Tennessee. He can be reached by phone at (615) 418-4023 or by email at matt.johnson@gprsinc.com.